Commencement and Reunion are two traditions that work hand in hand to define a student's experience. As a graduating senior, you eagerly anticipate the moment when you and your classmates carry the chains of laurel towards Mary Lyon’s grave surrounded by the smiling faces and cheers of encouragement from alumnae spanning the generations. As an alumna returning for Reunion, you can’t wait to enthusiastically help welcome the newest class of alumnae into the fold. For many years, the Laurel Chain Ceremony served as this first point of connection, but in 2011, a new tradition was formed that has quickly become a cornerstone of the Commencement/Reunion event. Philanthropy is in Mount Holyoke’s blood, and giving back is one of our oldest traditions. Since Mary Lyon traveled across New England with her green velvet purse, collecting charitable gifts from local citizens in order to found an institution of higher education for women, philanthropy has been important sources of institutional momentum. In 1837, the gifts of money, furniture, and bedding were vital in enabling Mary Lyon to open the doors of the Mount Holyoke Female Seminary. Mary Lyon knew that through rigorous education, women would be empowered to change the world, but without a community that invested in this bold vision, Mount Holyoke would not have been able to open its doors to the first class of 80 trailblazing women. Today, annual support from alumnae, families and friends of the College continues to have a profound impact on our student’s lives. An iconic and memorable part of a tradition-filled graduation weekend, the Laurel Chain Ceremony is also one of Mount Holyoke’s most time-honored traditions. The class of 1900 was the first to take the laurel--long associated with victory and honor--to Mary Lyon’s grave during commencement week. The following year, seniors honored Lyon with flowers, but the members of the class of 1902 were the first to wrap the now familiar garland of mountain laurel around her grave enclosure. The laurel chain represents the unbroken linkage among all alumnae. The tradition has been modified and paused several times during its 116 year history. The seniors of 1923 carried a daisy chain in place of the then-endangered laurel, which until then had been picked in nearby mountains and the chain handmade by freshman. Class of 1924 honored Lyon with rose bouquets and long streamers. The laurel procession was revived in 1925 and carried on for decades until 1970 when seniors chose to carry peace symbols, an homage to on-going Vietnam War protests, and 1971 when seniors chose to abandon tradition in order to add money to the senior class gift. The class of 1972 voted to bring back the tradition, citing its importance to the community. 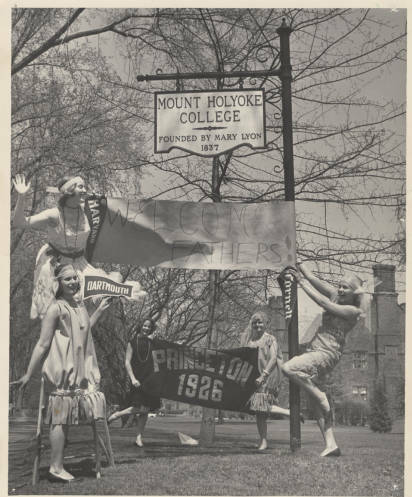 In the Spring of 1946, a very exciting change took place at Mount Holyoke College. For the first time ever, parents were invited to participate in May Day festivities. Viewed as a welcome chance for parents to better acquaint themselves with their daughter's’ college lives, the popularity of the event inspired the college to host its first ever official “Parents’ Day” in 1951. As then college President Roswell B. Ham writes in the event invitation, the special day was for parents to “see their daughters and the college in action.” The day’s itinerary began with visits to morning classes and a student-faculty basketball game and included a canoe meet, an archery exhibition, two water ballet performances, and concluded with the Dramatic Club Play, “The Constant Nymph.” The highlight of the day was the presentation of the May Queen and her court. Her identity kept secret until that moment, the May Queen was traditionally the most beautiful girl in the senior class and members of her court were likewise chosen by the student body for their beauty and grace. About 250 families attended that first Parents’ Day. There have been many changes to dining at Mount Holyoke over the generations, from students preparing meals alongside teachers in 1837, to dorm-wide meals with student servers (and designated napkin cubbies) in the 1950s, to personal pizzas at Blanchard and the beloved Sunday brunch. While dining has changed over years, one tradition continues to connect current students back to past generations, while also looking to the future. Now known simply as “Gracious Dinner,” this tradition offers monthly themed dinners that combine education and celebration. These dinners, located in different dorms each month, center around a specific cuisine, and are used as a way to give the community a glimpse into a different culture or to bring awareness to a special topic like sustainable and locally grown food. To elevate the event, tables are set with tablecloths and cloth napkins, which harken back to the gracious living that dates back to the 1950s. One of the defining features of the Mount Holyoke experience is our diverse, global community. Throughout its storied history, Mount Holyoke has drawn students from all over the world, and alumnae have been inspired to live and work on every continent. For almost 180 years, this community has been united by a commitment to learning and purposeful engagement in the world. This important event is named after Hortense Parker, Mount Holyoke’s first African American alumna, who graduated in 1883, less than two decades after slavery was abolished in the United States. Although officials were unaware that Parker was African American until she arrived on campus in 1878, she was allowed to enroll in classes and live on campus despite the segregationist practices of the time. While at Mount Holyoke, Parker was known on campus for her musical ability, and was frequently asked to play the piano for students and faculty. Each year the celebration grows and evolves, with a unifying theme connecting the festivities, such as Deep Roots and Still Growing, Pathways: My Journey from Here to There, and Remembering the Past, Engaging in the Present, Transforming your Future. Keynote speakers include alumnae, educators, authors, and community leaders, who help frame the conversation around race and identity. Many of the celebrations have included a community art project which helps members of the Mount Holyoke community reflect on the impact of women of color on their lives and their own journeys. In 2011, an annual essay contest was launched, and the winners share their essays relating to the celebration’s theme as part of the event. Though Hortense Parker Day has traditionally been celebrated in the spring, this past year the event was moved to the fall, allowing the important conversations around race and identity to frame the campus conversation from the start of the year.